JHM asked some questions about Matra rocket pod colours in the build thread for his very excellent "Meteor-Hog" here: http://www.whatifmodelers.com/index.php/topic,8242.msg109321.html#msg109321 but I didn't see them at the time, and since that build is now finished, I thought a separate thread would be more useful. I can find pictures of RAF Matra pods in all sorts of colous schemes including all-white, correct underside colour, incorrect underside colour, topside cammo and tatty-looking mix of greys. However, the most common, and I think attractive scheme has a black nose cone, "aluminium" body, and "steel" tail cone (inverted commas because those are just my impression of the colours: I don't know what the actual materials are). It was pointed out on JHM's thread that Matra pods are anachronistic on a late-'40s RAF aircraft because the RAF didn't adopt them until the mid-'60s. That might be true for service aircraft, but it's always been my impression that the RAF were rather late adopters of the Matra pod, being wedded to the 3" RP longer than it's performance really justified. Does anyone have any dates for when Matra pods were actually invented and available on the market? b) the heads of the rockets protruding beyond the slope of the tube muzzles, thus making the pod nose "bumpy" rather than "holey". Either way, that implies that most of the "holey-nosed" Matra pods supplied in kits are therefore, by implication, empty. Is this correct, or have I got the wrong end of the stick? 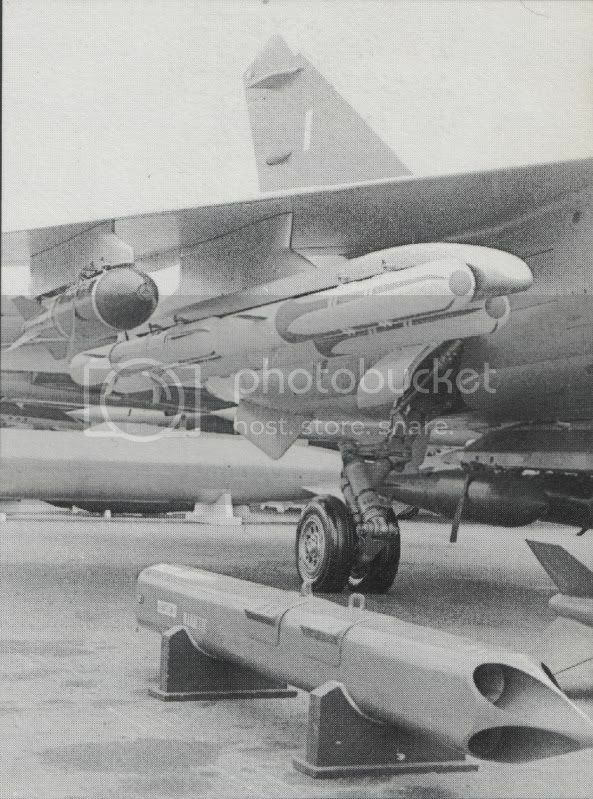 The SNEB rockets fired from the Matra pods were developed in the mid 50s. I would assume the pods were developed at about the same time. I think the RP-3 was used for so long because key British aircraft were wired for it (Hunter, Vampire, Venom, Sea Hawk etc), and it was kept in service until these aircraft were retired. Perhaps modifying these aircraft with pylons that could carry the Matra pods was deemed too expensive or wasteful? The ubiquitous Matra pod. It's not difficult to find pictures of aircraft carrying & firing them from the 60's to the 80's & many kits of European aircraft include them. So you think it'd be easy to find information on them wouldn't you??? The only hard info I can find is the Wiki entry for the SNEB 68mm rocket. They list the Matra 166, 155 & JL-100. Matra 116. Expendable launcher, carrying 19 rockets. Matra 155. Reusable launcher, carrying 18 rockets. Matra JL-100. A reusable launcher carrying 19 rockets (this is what Wiki says but I think it's 18), with a 250 litre fuel tank mounted behind it. A unique arrangement as far as I know. The Matra 116 & 155 were used on many types, but, as far as I know, the JL-100 was only mounted on the Mirage & Saudi & Kuwaiti Lightnings. The Mirages used them on a single mounting, the Lightnings on a twin overwing mounting. The Airfix Mirage III has two & Odds & Ordnance do a set of four with mountings for the Lightning. Quite good for whiffing, as it's quite unusual. I'm pretty sure there were other types. I've heard of a 36 shot pod (& vaguely recall a 24 shot pod, but I'm not certain), that may only have been stressed for subsonic flight. There may have been versions that didn't use the SNEB rocket, I've caught snippets of a 100mm rocket but I can't find any info. The 100mm rocket came in 4 and 6 round pods - more details when I get home. I think there was a 36-round pod too. Also, the Thompson-Brandt 68mm rockets used on French helos are related. 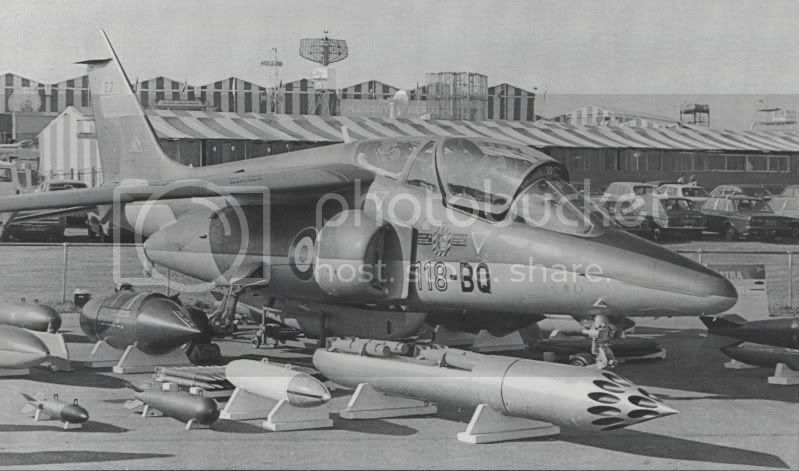 Found some more info on the 36 shot pod, it was in the fourth MAM article for the TSR.2 First tier six rockets, second tier twelve, third tier sixteen (either they've got that wrong or it's a 34 shot tube). Length 8ft, diameter 1.6ft. 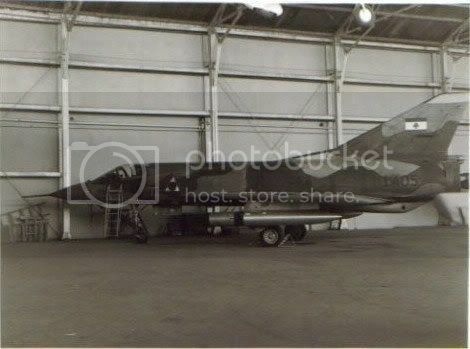 It mentions it's not stressed for supersonic flight, although the pic shows some pods in front of a Phantom & it was slated for use in the TSR.2. Answering your earlier question Weave, it mentions that development of the SNEB rocket started 'in the early fifties'. I'm not sure when if the Matra pod was developed hand in hand with the SNEB. Thanks Weave! If anyone's got any pics I'd like to see them, especially the CEM-1. The 3 Row sneb pod uses a smaller diameter rocket (50mm ?). This was the FAA pod as carried by Buccaneer, Sea Vixen, Phantom and Sea Harrier. The RAF Harrier GR3 had to use these when onboard ship for the Falklands War as the the Naval electronic environment onboard ship conflicted with the 68mm Sneb pod !!!! (thats why they are in the Airfix Harrier GR3 kit in 1/48th). The TSR2 was going to use the 50mm sneb pod for chaff dispenser, which is why TSRJOE is on a quest for a proper 3 row 59mm sneb pod in 72nd (the only one available so far being the one in Czechmaster Bucc but that mistakenly uses the same body as the 68mm pod and the 50mm was actually fatter in diameter). Ah, thanks Geoff. I read the same, & that the pylons on the RAF Harriers had to be modded to take the RN pods. I've seen them described as 2"/50.8mm rockets (pedantic, I know!). Good luck to Joe with his hunt, I know it's not easy to make the nose cones. The 2" FAA roackets are sometimes described as "Microcell", though I'm not sure if that's the rocket or the launcher. The same rockets were used in the quarter-circle-section flick-out launchers that could be fitted to an export Lightning in place of the Red Top pack. I've got a pic of the CEM-1 at home Mossie - I'll scan it for you. The attached reference drawings were obtained from OrData the on-line Ordnance Data Resource that may be of some use to you. Pictures from Aircraft Weaponry of Today by Roy Braybrook (Haynes 1988). In this picture, the large store at the front in the CEM-1 training version, with four practice bombs. Apparently, alternate loads for the operational version are two Durandal or six BAP-100 anti-runway bombs: presumably the BAT-120 frag bomb could be substituted for the latter. There was also a recce version with the rockets replaced by four cameras. It isn't captioned, but I suspect that the small store to the left of the CEM-1 is an 6-round F2 pod with frangible nose covers in place, and the black store behind it is a 36-round F1 pod. In this picture, the store in the foreground is a Type 100-4 launcher for four 100mm Thomson-Brandt rockets. Jeff, thanks. I always found OrData a little difficult to use, maybe just need to get used to it. Thanks Weave, those shots are great! The CEM-1 seems to be very similar to the JL-100, with a cutout in the tank body to take the weapons. And a Lightning with twin mounted overwing JL-100's. Wasn't sure about the roundel at first, but now I realise it's the symbol for the Queens Award! But am I imagining things, does that look like a pylon under the wings near the wing tip with another rocket pod on it ?